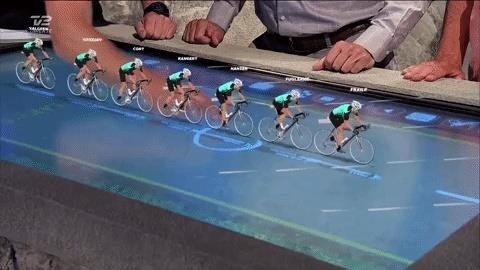 The Super Bowl of cycling, the Tour de France, expands its TV program this year by Augmented Reality. 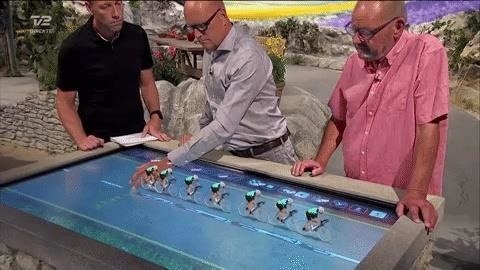 Denmark's TV 2 has built a new studio for the show, featuring on-air personalities, virtual backgrounds and behind a large touchscreen tabletop that will display 3D content to aid in the analysis of the race. "We did not use virtual sets in the studio last year," said Klaus Bøgeholdt, production manager at TV 2 Sports in a recently published blog post. "Instead, we used a large circular horizon with the pressure of an alpine landscape, and this year we decided to create the entire background as a virtual graph (blue screen)." TV 2 used 3D graphics software from Vizrt virtual content. The Viz Engine platform demonstrated the studio's virtual backgrounds, AR content and touchscreen board, while Viz Pilot enabled the production team to create 3D content using journal templates. "Working with virtual graphics is pretty new to us, and we've been working with AR graphics for a few years now a virtual background connected to our physical elements in the studio was a fun challenge, "said Bøgeholdt. "I think virtual graphics can be very special when used with physical scenography, and when both elements interact (physical scenography and virtual graphics) it is sometimes hard to say what is physical and what is virtually on set "I think we've achieved something unique this year by taking advantage of the best of both worlds." Picture by Vizrt / Vimeo  The network used the technology for the first time for coverage of the World Cup. In addition to the Tour de France, the network is broadcasting the Vuelta a España race in Spain, for which they can build a similar production. "The main reason for this is that our main studio is TV 2 this year. It should be flexible enough to match the scenography of the World Cup and the Tour de France," said Bøgeholdt. "I immediately saw how valuable it was for our on-air experts to have an AR tool that could just show what they were saying and that not only could the audience hear but also see what the expert was I thought it might be fun to modify it for cycling. " Similarly, TV productions are now turning to technology to revitalize their live broadcasts and combat cable cutting. We've already seen similar implementations of The Weather Channel and TNT's NBA coverage, and we expect it to become more commonplace as the technology becomes more accessible to production teams.